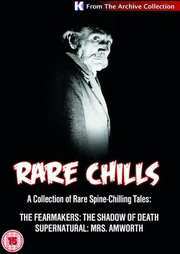 I’ve always been a been a big fan of concise, TV horror anthologies. 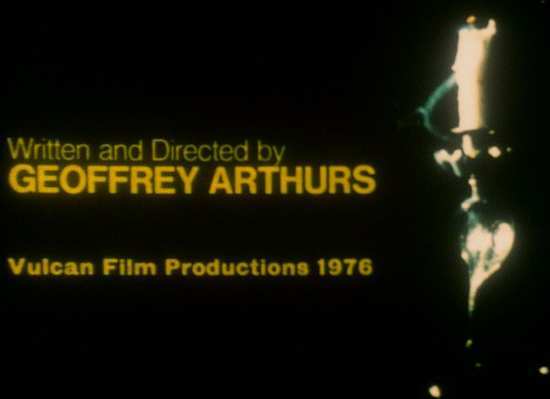 From ‘Thriller’ (both the 60’s Boris Karloff hosted version and the completely unrelated Brian Clemen’s penned UK television one) to ‘Tales from the Darkside’ and beyond, there is something very satisfying about short horror tales. 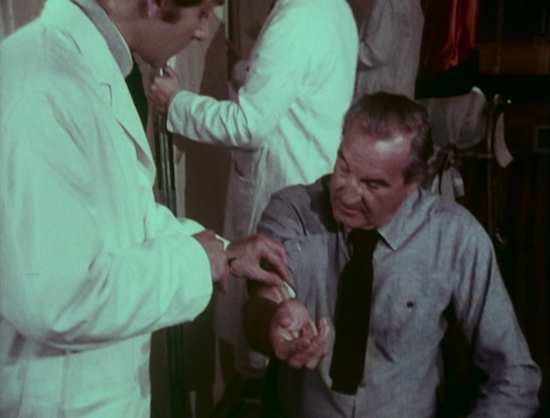 The best of them use an incredible economy of storytelling, perhaps best represented by some of the anthology movies of the sixties and seventies, like ‘Tales of Terror’ and ‘Vault of Horror’. This volume revives two old (and unknown to me) episodes from the grave; both resurrected and released by ‘Kaleidoscope’, the fine folk responsible for locating and repairing many episodes of TV shows thought lost forever. They’ve partnered with Simply Media to market some of their hidden gems, so I guess the more of you that support these endevours by buying the discs, the more they will be inclined to release over time. Which I, for one, am incredibly grateful for. 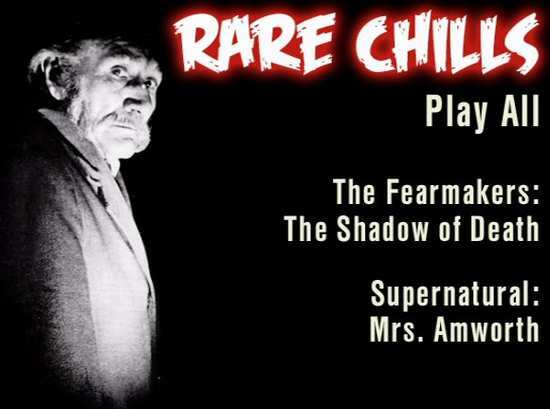 In what is a fairly slight release (running for under 60 minutes), two 25-minute helpings are served up: The Fearmakers: The Shadow of Death (an unaired pilot) and Supernatural: Mrs. Amworth, originally destined to be part of an on-going series called ‘Classics Dark and Dangerous’ but which aired all on it’s lonesome in a one-off airing in the mid-1970s. Turn the lights down low, set the phone to silent and steel yourself for a fairly rough and ready, and decidedly creepy 25 minutes. Although this may have been mastered on video, the print used for this transfer is a 16mm copy which looks like its seen better days. As much of the drama is set in ear darkness, or candle-light at best, it’s not the best quality video you’re going to see this year, with lots of grain, plenty of blemishes and contrast and detail levels which are quite lacking. 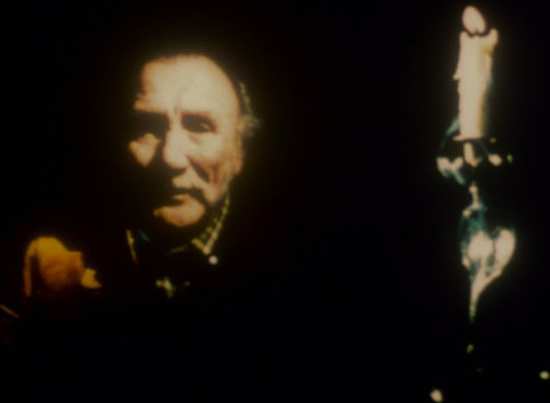 But this, combined with some very folksy hand-held camera-work arguably add to the brooding atmosphere of the piece. 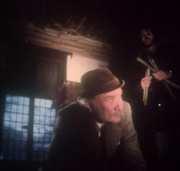 Booth (Jack Woolgar), an older chap with a handle-bar moustache, making him look positively Victorian, visits a large, deserted mansion in the middle if the night. 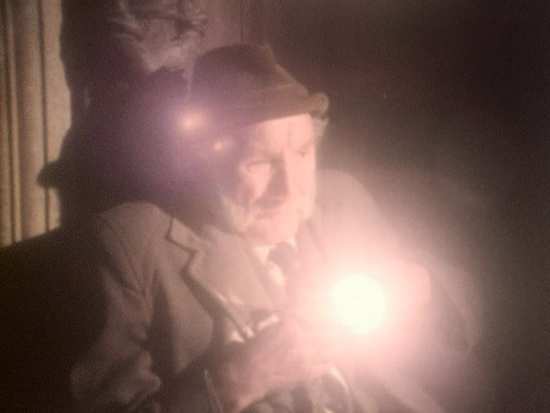 He has a torch, his only means of illumination, and we see him creep into the house, clearly searching for something. Eventually he locates a large diamond, hidden beneath a tile in the disused fireplace. Just as he leaves, a storm breaks and he elects to wait it out in the shelter of the manor, despite it feeling decidedly inhospitable. When he hears an unusual noise, he soon discovers another man in the house; a young man wearing a parka, Weaver (Barry Stokes) who claims he was out walking and came into the old house for shelter. Booth, for his part, makes up a story that his car had broken down nearby – but before long, it becomes clear that Weaver doesn’t believe him. In fact, he seems to know quite a bit about Booth and also seems to know why he is in the house. It becomes clear that Weaver is also after the stone, but some strange presence in the house seems set on preventing either of the men from taking it. Despite its ragged production (it was a pilot after all) the performances pull it through and it’s a genuinely unsettling watch – which is what you want from a ghost story, isn’t it? The weird sound effects and electronic score certainly add to the atmosphere too. All in all, a lot of fun. 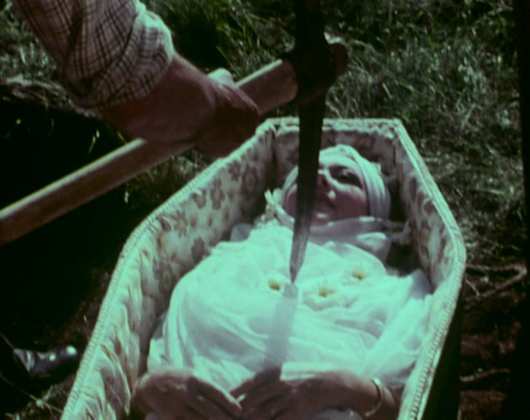 On balance, I think the second instalment, Mrs. Amworth, the first in a planned series of shorts to be aired under the ‘Supernatural’ moniker, is the more enjoyable of the pair. 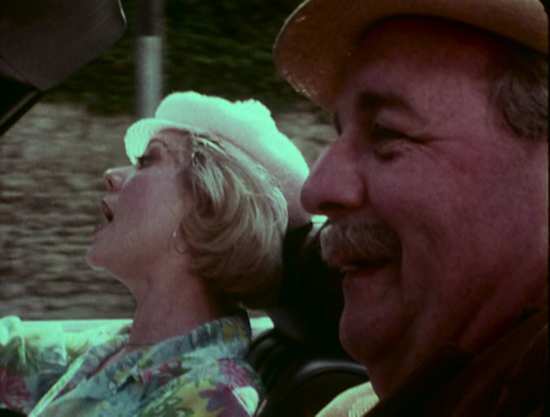 It’s certainly a bigger budget affair, shot on film and with some really top-notch performances. Set in a British village, stuck in the heart of sleepy countryside, things are somewhat shaken up with the arrival of ‘Mrs. 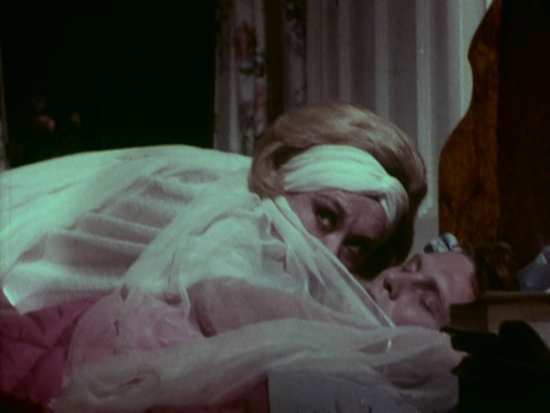 Amworth’ (played superbly by Glynis Johns). In comparison to other residents, she’s full of zest, boundless energy and is prone to zooming around the area in her sports car. She hosts regular parties at her country pile with no expense spared. Curiously, a mysterious epidemic has hit the village, coincidentally in tandem with Mrs. Amsworth’s arrival where residents are drained of all energy, left pale and lifeless. When a handsome young man arrives (David plated by Pip Miller) to spend the summer with his uncle Benson (Derek Francis), he draws the attention of the older lady, and for his part, he’s fascinated by this extraordinary woman who barely pauses for breath as she organises everyone around her and who never seems to have time to eat. Before long, David falls foul of the peculiar illness, confined as it is to that particular village. Whilst the level-headed believe it to be the result of a gnat infestation, Benson’s friend (John Philips) suspects something far darker. 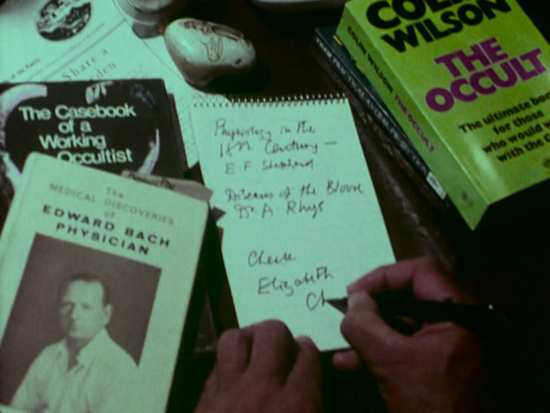 A voracious reader of books on the occult, when he discovers that Mrs. Amworth is ‘related’ to Elizabeth Chaston, who was accused of being a witch in the village during the 17th Century during an identical plague, he is utterly convinced that her arrival is no coincidence. Stakes at the ready, he starts to make plans to be-rid the village of her evil menace. Fans of archive TV, and horror in particular, will find much to enjoy here, though with a running time of under one hour, for some it will be of questionable value. For my part, I’m happy that such things are finding any kind of outlet and am happy to do whatever it takes to encourage more of the same. If this sounds like your bag, support the cause and buy a copy post-haste.